Running and walking are fun, challenging, and great for your heart, legs, brain, bones and lungs. Most of us hear over and over that we should exercise to lose weight and look attractive to other people; it’s easy to lose track of the many other benefits of getting that heart pumping: increased strength, greater stamina, a counter to heart disease and high blood sugar, improved self-esteem, and more. Regular exercise is crucial to the health of people of all ages and sizes, and progress shows itself in more ways than the number on a scale. 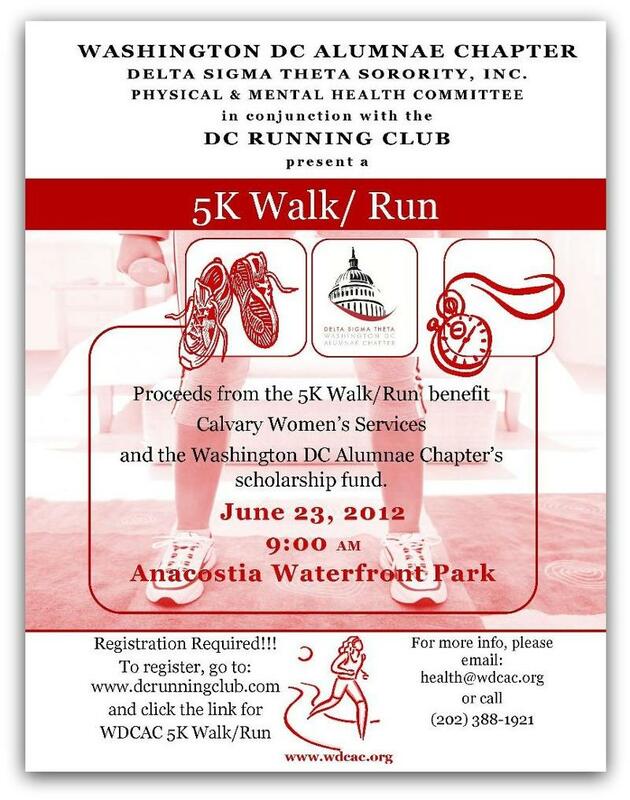 I hope you are feeling good about your journey towards our 5k with the alumni of Delta Sigma Theta on Saturday, June 23. Unfortunately, we sporting types are not immune to injury, and though we wish we did, we don’t control the environment around us. I believe the benefits far outweigh the risks of running, but there are steps you can take to stay healthy and safe throughout your training. Please remember to consult your doctor before beginning any exercise program. Exercise in a place and at a time that you feel safe and comfortable, whether it’s your neighborhood, a school track, a nearby park or a gym. Carry a cell phone, an ID, a SmarTrip card, and a few dollars whenever possible. These few items will fit in your pocket and keep you prepared for the unexpected. Let someone—a spouse, a roommate—know where you will be and about when you should be back. Stay alert. If you listen to music while you work out, keep the volume low. Know if there are cars, cyclists or people around you. Obey traffic signals. Keep an eye out for holes or obstacles in your path. You probably do many of these things instinctively, but don’t forget them now that you’re moving with a new purpose. Be visible, especially to cars, especially at night. Many companies make exercise clothes with reflective elements in the fabric; others make vests, tags, or lights that attach to you. At the very least, if you are out in the dark, wear light-colored clothing or stay in lighted areas. Drink plenty of water. Before, during, and after workouts. At work or at home. I keep water handy at all times to keep myself hydrated. Stretch. Running and walking can make muscles in your legs, hips and back stiff and sore; stretching keeps them lose, which helps prevent injury and improves your workouts. Take rest days. Really. You may be tempted to work hard every day, but your body functions best when it has a chance to recover. Dress for the weather. Wear loose, breathable fabrics as you train this spring. Don’t forget a cap and sunscreen! Listen to your body. Learn the difference between a comfortable pace and a challenging one. Notice if you are sore in your muscles (a sign that you are working them) or in your joints (a sign that you may need to see a doctor). If you are wiped out, take a rest day. Find that balance. How do you stay safe and healthy while training? What challenges do you face?